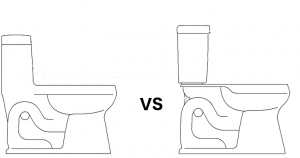 One Piece vs Two Piece Toilet - Which Is Better? Buying a toilet is an easy task, especially when you know the specifics behind the different types of toilets and which type you are looking for. When it comes to one piece versus two piece toilets there happen to be quite a few differences. Keep reading for information about both, as well as advantages and drawbacks of each type. This is a toilet that comes in one piece. The entire thing is molded together, so you just have to install one part. Easier to install. Since there is only one piece to be concerned about moving, this type is easier to install. It is less likely that you’ll need to hire a plumber to do it, especially if you know someone that is handy in this type of area. At the same time, if you don’t know anything about installing a toilet, you should do plenty of research ahead of time before you try it for yourself or hire a professional to take the guesswork out of the process. Cleaning is less complicated. There aren’t a lot of crevices that can accumulate dust and germs, so this type is easier to clean. It’s a pretty straightforward process which shouldn’t take up a lot of your time. Better aesthetic appeal. Many people like the way that this option looks more than other types. This is because it is a solid design that is also simple. Some may not even know why they like this type’s look better, but it seems to be the case in many instances. Tank won’t need extra support. The tank doesn’t need to be installed separately, so you don’t have to worry about supporting it. Instead, it is included in the design of the one piece, so you only have to worry about the footprint. Better for small spaces. This is a better solution if you have a small bathroom or space where you need to put a toilet. These take up less space for the most part. More expensive. The one piece system hasn’t been around as long as the two piece system, so they may cost a bit more. In some cases this will be a big difference and in others a small difference, so keep your options open. Have to replace the whole thing. You will have to replace the whole toilet if one part becomes damaged or cracks. While this is something that is rare, it can happen, so be sure to be careful with your toilet whenever you install it and use it. This type of toilet comes in two pieces. One piece is the tank and the other is the bowl. Can just replace one part. Since there are two parts, you can just replace the tank or the bowl if something breaks or doesn’t work properly anymore. This can save you money, since you won’t have to buy a completely new product. Weigh less. Another great thing is that this type weighs less because there are two pieces. In some cases, this can be up to a 50 pound or so change in weight, so you won’t be breaking your back when you are trying to install a two piece system. Cheaper. They are also cheaper, since they have been around for quite a while. One piece systems are younger and in some places are still not widely used. Harder to install. Some people think that this type is harder to install, since the tank has to be level and supported properly. In other words, most won’t be able to install this in their house by themselves unless they have the proper tools and know how. More chances for leaks. The tank is more likely to leak, especially as the toilet ages and the tank and bowl might not be lined up as precisely as they once were. Some things about both models are the same. Here is a look at some of these aspects. Power. Both of these types operate the same in terms of how well they work and the power of each flush. There is no differences overall, although there may be a bit of a difference from model to model. Height. If height is a big issue for you, both types have various heights you can choose from, so you can find one that will keep you the most comfortable. Inner workings. There is virtually no difference when it comes to the use of these two toilets and what is inside of them. They have the same components, so there’s no reason to think one operates better than another. Lots of people feel that a one piece toilet is the way to go, although that isn’t necessarily true. If you have used two piece toilets in the past and have had no problems with them, there’s no reason to think you will have issues with them in the future. At the same time, one piece choices are easier to install and care for, which may be something that you are looking for. When you figure out what you are looking for in a toilet and which kind will fit in your bathroom correctly, you can figure out the proper one for you. You can also decide if you will need help with the installation. The good news is that they are both available in a wide variety of designs and colors, so there’s something you can find that will fit your needs, no matter which type you are considering. If you still aren’t sure, it is beneficial to do some research online to see what you think or ask people you know what type they have and how well they work. They should be able to tell you of any problems or benefits that a certain model has, making your search even easier.